Don't have rope? Heavily pregnant with a pile of cloth scraps and nothing to do? Make rope! Or stuff pillows! It's that easy. 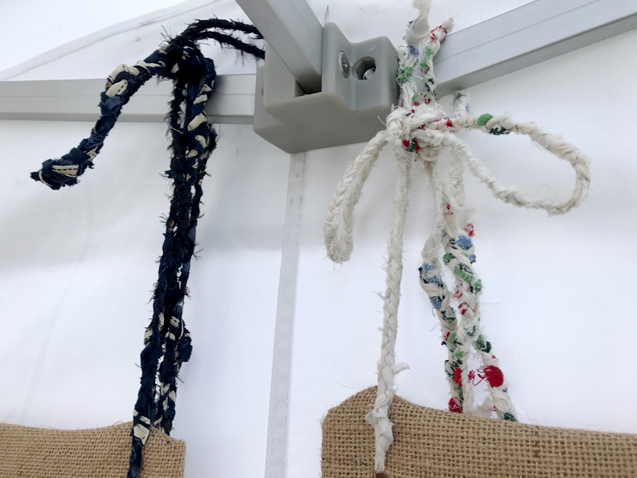 Remember in March when I shared my homemade twine? I had envisioned weaving the end product into a basket. 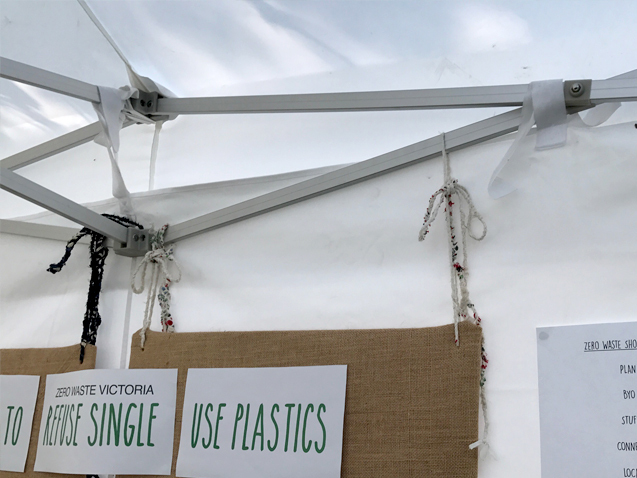 This did not happen and the rope made its way to the Zero Waste Victoria’s stall the past two weekends where it was used to hang their information boards. I am still proud of my efforts to upcycled material despite not having the basket I had planned to make. The end product fits the stall perfectly. 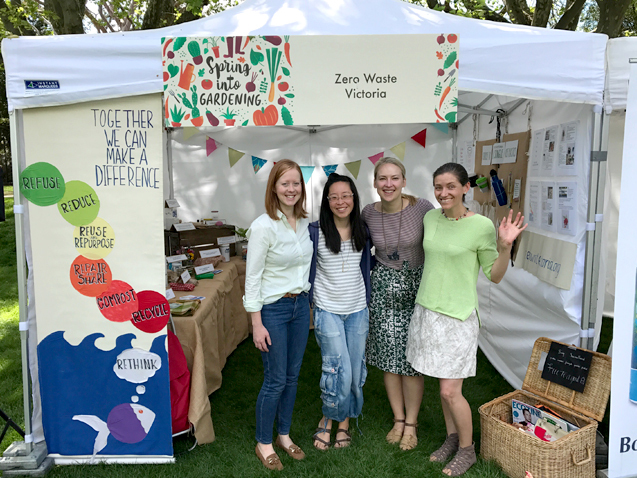 A little background on the Zero Waste Victoria info stall. It grew from Zero Waste Victoria's Facebook group I'm part of. I didn't start the group originally but was asked to help out with admin as their numbers grew. I've enjoyed watching this Facebook community and many others expand and multiply across the country. 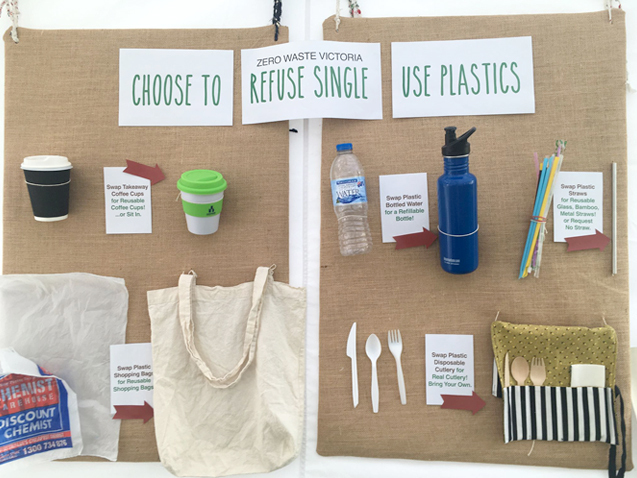 In January I posted an idea to the Facebook group about running an info stall at Australia's Sustainable Living Festival as a means to educate others. The idea was met with a passionate response and soon enough we had not only put together our education stall, a website was born too. 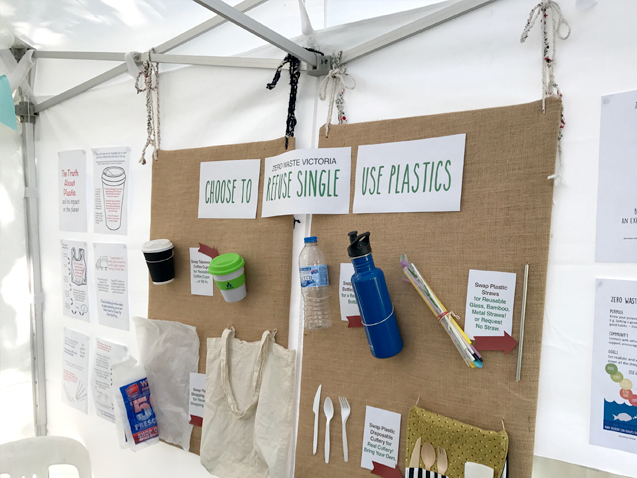 These past few weeks the stall has featured at Spring Into Gardening and Practically Green festivals, which have a focus on sustainable living. Below is a photo of us at Spring into Gardening. November will see the education space set up at Burrinja Climate Change Biennale 2017 and Fair@Square Moral Fairground offering a beeswax wrap demonstration. If you would like to hire our stall for education workshops and talks, you can contact us through the website www.zerowastevictoria.org. 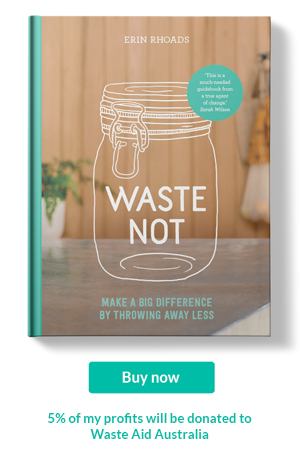 Once I wrap up my last workshops for the year (details on Facebook) I'll be turning my attention towards the Zero Waste Victoria website to see what we can do with the space. How pretty are the flowers? 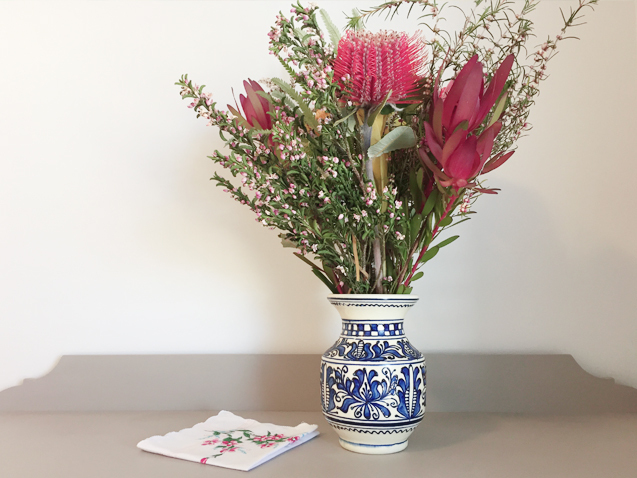 These beauties were presented to me by Wendy, owner of The Source Bulk Foods Bowral after a talk I gave at her event. The handkerchief to the left was carefully wrapped around them, a thoughtful nod to my love of hankies. While it was lovely to receive these I felt like I should've passed them back to Wendy and her team! Truthfully my ability to reduce rubbish is made easier by people like Wendy. 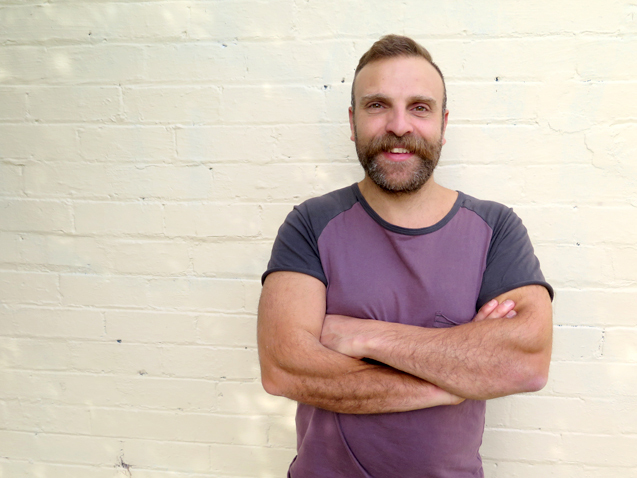 Running a small business is not easy, especially one that is in competition with the big supermarkets. I can only imagine it would take guts, passion and self belief to set store up against Coles and Woolworths, or whatever big supermarket chain it is in your country. It's not just the Wendy's I'm grateful for. There are other small business owners, in brick and mortar stores and online, working their butts off making the reusable revolution accessible. There are so many of you out there. I was chatting with Zero Waste Victoria's awesome volunteers on accessibility and zero waste living. If there is no accessibility people won't be move towards it. I know there is a long way to go yet for making this lifestyle anywhere close to normal, but aren't we lucky to have pioneers willing to stick there necks out, setting up systems that will have a lasting positive impact on the environment and generations to come. This is a just a little reminder for myself to thank the people opening these type of businesses that make it easier to choose and live sustainable, keeping it unpackaged and low waste. I really do appreciate it. Well the blog has been a little quite lately. Due in part to Tifl becoming more active and wanting to play. He's sitting, rolling, dragging himself around the house, each development exciting and terrifying to witness. I've also spent the last few weeks working on secret projects while preparing for and running zero waste workshops. Anyway, a happy little email from Brooke McAlary of Slow Your Home bounced into my inbox last week about one of the secret projects, giving me the green light to share it with you. If you know the Slow Home Podcast then you can hedge a bet the project i'm about to talk about will be awesome. And yet somehow I was asked to be part of it. 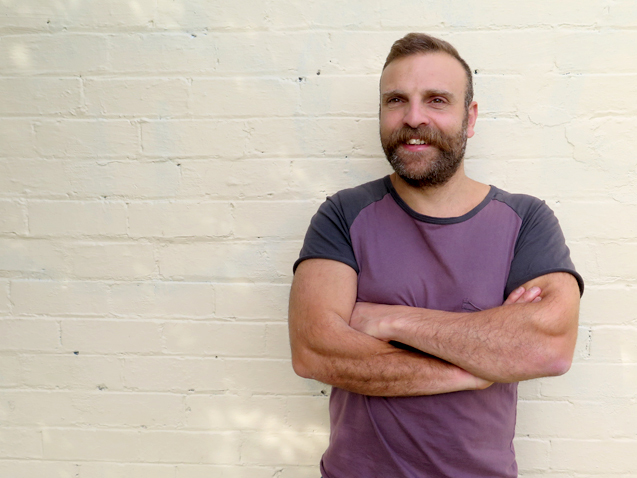 Brooke and her partner Ben have put together Live Life Simply a six-week slow living retreat, and if you click through (which I hope you do) you'll see my face as one of the facilitators along with a host of talented people sharing wisdom on slow and simple living. The online course is for anyone wanting to realign their priorities in a fast paced world. A six-week, all-access pass to more than 15 seminars by some of the leading experts in slow and simple living, where we focus on learning the essentials of meditation, mindfulness, simple productivity, low-waste living, easy whole foods, mindful money, slow yoga, low tox living, slow technology, bringing family members along for the journey, and how to create slow rituals on even the busiest of days. 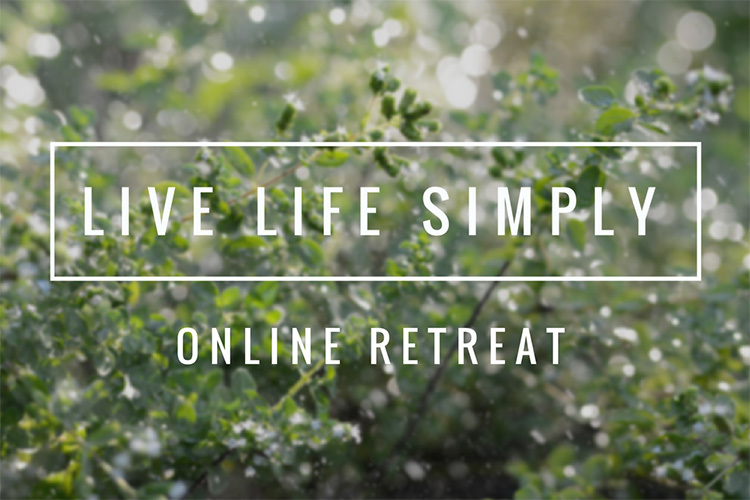 You will also have access to videos, audio files, workbooks, playlists and questionnaires, all designed to help you slow down and simplify life not only over the six weeks of the retreat, but for the months and years that follow. The retreat opens on October 23, 2017 and you will gain immediate access to everything and are free to work through each session at your own pace. Plus a private Facebook group to ask any questions and connect with like minded folk wanting to set the foundations to create a life lived simply. Spaces are filling up fast so get in now to learn more and to reserve your spot today. I'll be back to share more about the retreat this week on social media. But for now I have to practice a presentation I'm giving to Scouts Australia.